Al Basel and Deyaar officials. The award recognised Al Basel’s outstanding performance as one of Deyaar’s sales partners - resulting in a 15 per cent growth in 2014 for the developer, said a statement. To date, the company has been very successful in leveraging Deyaar’s diverse portfolio of property projects, which includes the DIFC (Dubai International Financial Centre) Central Park building, Miracle Gardens – Mont Rose and Atria – Business Bay, it said. 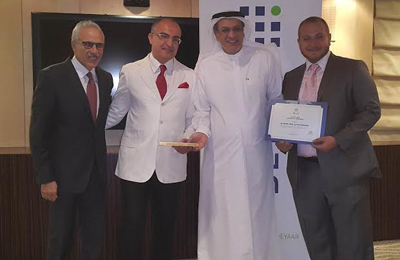 Basel Al Kasem, found and chief executive officer, Al Basel Group, said: “We are very humbled and highly appreciative for this distinct recognition given to us by Deyaar. This award demonstrates the strength of our ties with Deyaar while the successful move of selling their property offerings reflects the growing trust and confidence in both the Deyaar and Al Basel brands. Nasser Al Din Aly Amer, vice president for sales, Deyaar Development, said: “Our partnership with Al Basel has resulted in impressive sales of our property offerings that have also translated to our continuing growth as a company.